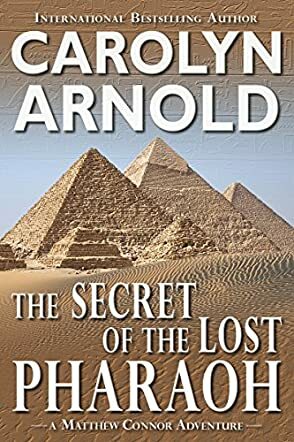 In Carolyn Arnold's The Secret of the Lost Pharaoh, Matthew Connor is once again called upon to unearth a legend. A map possibly pointing the way to the mythical Emerald Tablets is discovered by a colleague in Egypt, along with the tomb of an unknown pharaoh, and Matthew is being invited to the dig site. He has been fascinated with the Emerald Tablets for years, and the opportunity is too good to resist. He convinces his friends, Cal and Robyn, to leave their current commitments and go with him on another adventure. The archaeologists are aware of the danger in case the Emerald Tablets are found. Soon enough, they find themselves in sticky situations, not knowing who to trust. With the promise of ultimate knowledge and unspeakable wealth, everyone wants to get their hands on the tablets. It's just a matter of who's going to find it first. Matthew is determined to be that person. But first, they must survive. This is one of the most entertaining archaeological thrillers I've had the pleasure of reading. Right from the start, it gripped me and forced me to turn the pages as the author laid out the plot. I love ancient legends and Egyptology, and these are some of the things that prompted me to read this book. I'm glad I did. For four days I looked forward to the end of the day so I could go back and join the characters as they uncovered one clue after another, bringing them closer to the identity of the pharaoh and the Emerald Tablets. The background given on the various Egyptian legends and customs mentioned in the book satisfied the geek in me. The author made it real in my mind and strengthened my resolve to visit this country one day and see the historical sites myself. The Secret of the Lost Pharaoh is a polished, well-written, stand-alone novel that Indiana Jones fans will love. Carolyn Arnold has written a real page-turner, rich in history without being overly detailed, with a smattering of romance and suspense that will engage the reader from start to finish. The ending was bittersweet. Now, I'm off to read more of Matthew Connnor's adventures. I'm glad to give this book 5 well-deserved stars.